Himlung-Himal, popularly known as Himlung is 7126 m/23,380 ft. peak in Nepal. Himlung climbing is the most popular expedition among the 7000-meter peaks. It locates in Nar-Phu region which is the most isolated area in Nepal, frontier to Tibet. Thus, the explorer need a special trekking permit as region is under the restricted area of Nepal. After a constant successful Himlung expedition, Wild Yak Team confirms to depart this year on 14th October and last till 12 November 2019. Through our experience, we discover that the mentioned period is the appropriate time for Himlung climbing. The Mountain is suitable for the climbers who want to experience first time the high-altitude mountaineering or are preparing for the 8000-meter peaks. Himlung climbing is not that much technical besides few short steep sections which are mostly secured by the Wild Yak Team. But Himlung climbing does require a high level of fitness. It is a beautiful course of alpinism from its Base Camp to the Summit. The Base Camp is at 4850 meters above sea level. It is at the upper end of one of the pastures belonging to Phu village. In principle, three high camps need to fix before reaching the Summit. Camp I at 5450 meters, Camp II at 5800 meters and Camp III at 6350 meters. 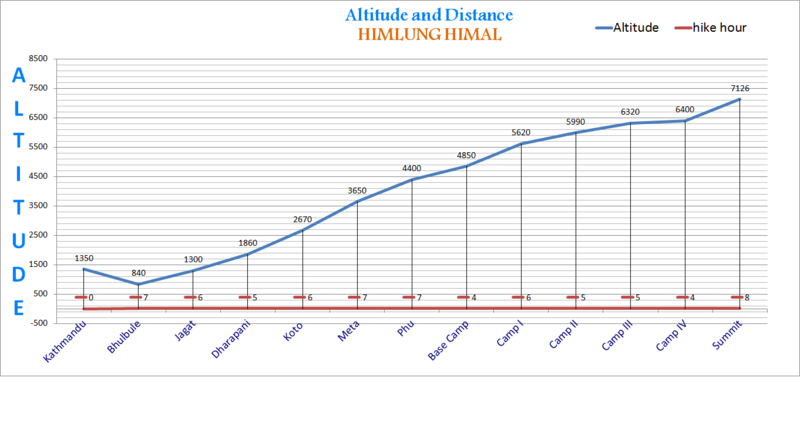 For more detail about Himlung climbing and the route follow the link. Besides the high altitude mountaineering the regions ancient architecture, ancient custom, culture, and biological diversity is sure to amaze anyone. The high peaks, isolated Phu village, narrow gullies, forests, springs, old monasteries, and unique ancient settlements are a stunning part of the journey to Base Camp. Warm Sleeping bag and Down Jacket are also available for a use in Himlung Base Camp. And Climbing gears such as down-suit, Big climbing shoes, jumar are also available to rent for Himlung climbing. The present price includes namely, a highly qualified Climbing Sherpa Team, perfect preparation and rest at the famous 5-star Hotel Hyatt Regency in Kathmandu. WILD YAK EXPEDITIONS’ philosophy is: as much as possible is included in the quoted price so that our Guest know the total costs of their adventure Trip in advance! WILD YAK EXPEDITIONS is focusing on group sizes of 4 to 6 participants only for its Himlung Expedition because our experience have found this to be the best way to have a successful trip while providing excellent services. Furthermore, it creates a pleasant ambiance within the Group, including an exchange of cultures and traditions with our local Team. Kathmandu: we stay at the famous 5-star Hyatt Regency on a sharing basis, including breakfasts, in order to optimize the preparation for this present Himlung Expedition. All dinners are served in excellent restaurants in town where you can enjoy various types of cuisine, from the typical Nepali, Thai, and even steaks and Italian meals. Each restaurant has been screened by WILD YAK EXPEDITIONS representatives to ensure that it is of suitable quality for our guests. The individual beverages, except at Base Camp, are on each participant's own charge. During our Campsite Trekking: according to our itinerary, at some specific defined places, we settle a campsite and enjoy the meals prepared by our Kitchen Team. The tents are provided by WILD YAK EXPEDITIONS on a sharing basis. Single tent can be requested but are charged extra cost (upon request at your booking). Each member has to bring his/her own sleeping bag, we provide you a thick mattress with a extra thin isolation tent mattress. Considering the roughness of the landscape and the hygienic conditions, WILD YAK EXPEDITIONS provides the Group with its own kitchen tent, sleeping tents, dining tent and toilet tent with the necessary staff to serve us delicious dishes and drinks. You can enjoy espresso coffee, a selection of teas, as well as Italian, Tibetan and local cuisines. Packages lunch are given on some days. For our clients’ convenience, considering the remoteness of the region, WILD YAK EXPEDITONS provides the lightening for the dining and kitchen tents, and solar batteries charging facilities at disposal of the participants. In some places, we stay in the lodges (small traditional mountain guesthouses) that are recommended by WILD YAK EXPEDITIONS as per defined itinerary destination. Please be aware that single rooms are not available. Base Camp: WILD YAK EXPEDITIONS’ Base Camp is comfortable, warm and well organised. Each participant has an individual extra double large tent. Light, insulation from ground and an extra large thick mattress with soft pillow are provided for each individual tent. Our triple skin base Primaloft dining tent is heated at evening and the ground is insulated. Our kitchen is hygienic, clean and equipped with modern utensils and stoves. Likewise the shower tent is facilitated with hot gas system, shampoo, shower gel, body lotion and mirror. The toilet tent is big enough to render a high altitude toilet comfortable, equipped with toilet paper and fresh Odinel. A water bucket with soap and hand sanitizer is at your disposal besides the dining tent. Similarly, a store tent and communication tent will be set up, depending on the number of participants. During this Expedition, you can enjoy various kinds of food, from the typical Nepali food to all types of international cuisine (Tibetan, Continental, European, Indian, Japanese etc.) You can also enjoy cakes and cookies, along with varieties of drinks, among others, hot chocolate, coffee and fruit juice. Fresh vegetables, fruits and meat are supplied as regularly as possible from our Kitchen Team. On request, for higher camps, a freshly cooked hygienic food or a packed food (as per condition) can be provided from our Kitchen Team as well as drinks and snacks. Lights and Generator: Base Camp is equipped with a powerful generator and a solar recharge system. The success of this Himlung Expedition depends on both the personal condition of each participant and the experience of our Team. WILD YAK EXPEDITIONS’ Team has been carefully selected according to their experience in the specific environment and personal aptitudes. Our Team is thus highly experienced, skilled, trained, courteous and helpful. WILD YAK EXPEDITIONS’ is proud to support our local staff by providing them with a fair salary, encouraging them to take mountaineering workshops, wilderness first aid training, environmental preservation courses, garbage management, team leadership, and language refreshers on a regular basis. Our Climbing Sherpa Guides: the number of Climbing Sherpas is depending on the size of the group of participants to this Expedition. Our climbing Sherpa Team is a professional qualified team with great experience in guiding at high altitudes in the Himalaya especially on numerous high mountains of the Himalaya and have deep knowledge about the culture and traditions of this part of the Himalaya. It is the Climbing Sherpas' role to fix all the tents and the rope at the necessary part of the mountain and, assist you all the way to the Summit. Our Kitchen Team: plays a vital role during the entire Expedition. WILD YAK EXPEDITIONS' Cooks are specialized, experienced and trained in outdoor cooking at high altitudes, respecting the fundamental principles of hygiene and proper management of the base camp and its surroundings. The Cook's role is also to manage the Base Camp in the absence of the Leader/Sherpa Team. Different types of cuisine and bakeries are served during the climbing period. Our Kitchen Team ensures also that the garbage is properly managed and the campsite is kept clean after its use. Before we choose the mountain to scale, we want to know some important details about its climbing route. Considering the experience of the mountain guides and ascenders, we developed a simple system of grading, which may help you to choose the right Mountain to climb up depending on your aptitude.